Join us on a candlelit walk and discover the secrets and stories hiding amongst the tombs of Kensal Rise Cemetery. Beyond the dates and names, beyond the bare facts and cold earth, beyond the veil, lies the eerie and fantastical carnival of life, death, beauty, and longing. We will share stories and songs of broken hearts and broken promises, of the dead who will not lie quietly sleeping, of creatures who look like us but are not like us, whose hearts are still whilst their eyes are quick, of ghosts and spectres, of darkness and light, of the sombre magic of autumn and the grave, as we cast our spells of story and song to protect us from the night. Vanessa Woolf (“London Dreamtime”) an explorer of London's secret stories and enchanted pathways and George Hoyle (“Cunning Folk”) who makes music rooted in folk traditions and ritual landscape. This walk will be starting at the Dissenters' Chapel. 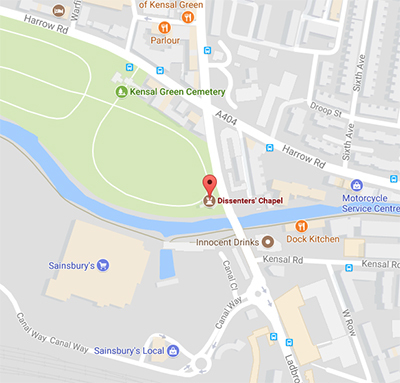 Please use the following travel advice to find the chapel - During the day guests can walk through the cemetery to get to the chapel but at night the main cemetery gates on the Harrow Road will be closed and the only accessible entrance is on Ladbroke Grove. Previously the address for this entrance was 364 Ladbroke Grove but this number has now been updated to 391. The two closest underground stations are Ladbroke Grove (Hammersmith & City or Circle Line) or Kensal Green (overground and Bakerloo Line). From Ladbroke Grove station there are several buses you can take to the Dissenters which include either the 28, 52 or 452. It's best to get off at the Sainbury's bus stop and then it's a short walk down Ladbroke to the entrance to the Dissenters' Chapel.